It’s time to look at DC Comics solicitations for March 2015. A full list of solicitations can be found here. This month marks a very big moment for DC. It’s the final month of books being published before they go on hold for two months, as DC’s offices move from their traditional New York City location to southern California to join the rest of the DC Entertainment/Time Warner operations. As such, there’s a pile of changes already coming: DC is canceling 17 of its books (both print and digital). 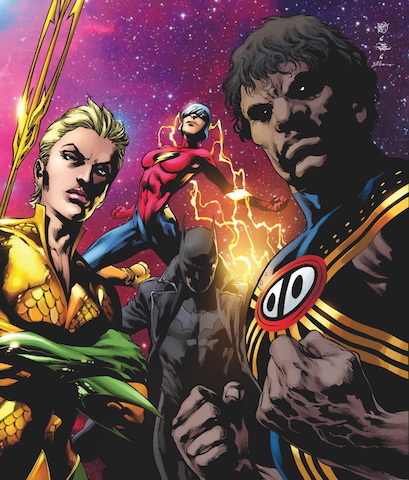 Some of them dated back to the start of the New 52 revamp, while others seem to be going out on a wimper. The latter’s the case for “Batwoman,” whose recent changes have prompted much controversy (for good reason). With Kate Kane’s book being axed, and Archie having canceled “Kevin Keller,” this means in 2015 there’ll be no book from a major publisher starring an LGBT character, as far as I know. In other news, Aquaman’s also now back to a single title, with “Aquaman and the Others” canceled. Whether any of these titles will be revived after the move is complete remains to be seen. Of course, I’m sure there’ll be plenty of new Bat-books to replace, um, the canceled Bat-books. A bigger questions is if this will also mark a shift in the way DC runs its comics side, as there’ll be different staff (and closer contact with some corporate heads) out west. “Multiversity” wraps up this month, leading into “Convergence” (aka “the Island of Misfit Heroes”). While it’s a $5 comic, since DC won’t be publishing much else in April and May, it might be worth buying. “Scooby-Doo Team-Up” finally sees the gang working with the Man of Steel himself (aside from that Super Friends team-up awhile ago). Lois Lane, Jimmy Olsen, and Krypto are in this too! “Strange Sports Stories,” a weird 70s title that saw, among other things, a baseball game between the JLA and their villains, is getting a miniseries revival via Vertigo.